We’ll show you, how to speed up SSH connections in Linux. SSH is a very secure method for managing Linux servers. Sometimes it can be very slow especially if you need to open multiple SSH connections to your server. One such scenario would be if you use Git for your development work, as Git uses multiple SSH connections to transfer files and if your server is not configured correctly it will add unnecessary overhead by re-establishing a connection for every file transferred. In today’s tutorial we are going to learn how to speed up SSH connections in Linux. Let’s get started! If you open multiple SSH connections to your server frequently, it would be best to configure your SSH client to use the existing connection when creating a new SSH session.This can speed up the sessions opened after the initial connection as it avoids the overhead of establishing a new connection. The ‘Host *’ directive above tells the SSH client to re-use the initial connection for all remote servers. Setting up a password-less SSH login is pretty easy and saves you time because you don’t have to enter a password when you open a new SSH connection.This can be done in three easy steps. Enter file in which to save the key (/root/.ssh/id_rsa): Press Enter. Enter passphrase (empty for no passphrase): Press Enter. Enter same passphrase again: Press Enter. If everything goes well you should see the output displayed above. Changing the default cipher order for the SSHv2 protocol on the OpenSSH server can further speed up SSH connections as some ciphers can encrypt data faster than others. According to several benchmarks available online, aes128-ctr is twice as fast as chacha20-poly1305 on processors that support the AES-NI instructions so if you have a high-bandwidth connection to your server the file transfer speed should increase significantly after making the change. That’s it, now your SSH connections should be a lot faster. 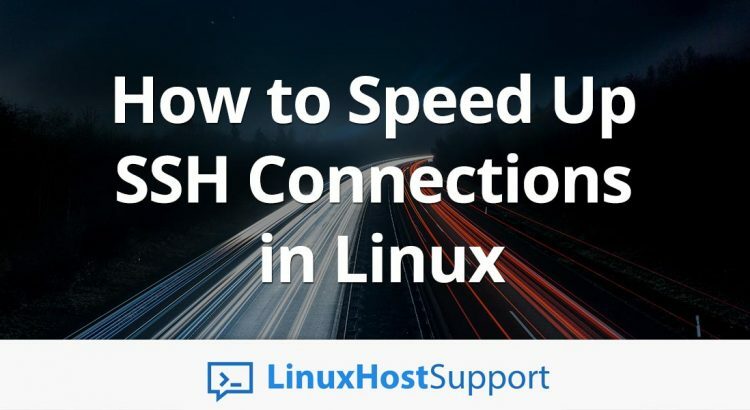 Of course, you don’t have to Speed Up SSH Connections in Linux, all by yourself, if you use one of our outsourced linux support services, in which case you can simply ask our expert Linux admins to speed up the SSH connections on your Linux server for you. They are available 24×7 and will take care of your request immediately. PS. If you liked this post on how to speed up SSH connections in Linux, please share it with your friends on the social networks using the buttons on the right or simply leave a reply below. Thanks.